Dan Lentell talks with Richard Hills-Ingyon and Gaelle Stark-Ordish of For the Trumpets Shall Sound (and is joined unexpectedly by their colleagues Samuel Morgan, Kayleigh Hawkins and Bill Rose). The story of finding love and support in the most hostile of environments. 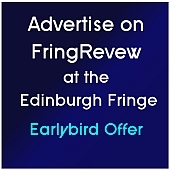 This entry was posted on Tuesday, August 20th, 2013 at 11:48 am and is filed under Audio Interviews, Edinburgh Festivals 2013, Edinburgh Fringe 2013. You can follow any responses to this entry through the RSS 2.0 feed. Both comments and pings are currently closed.